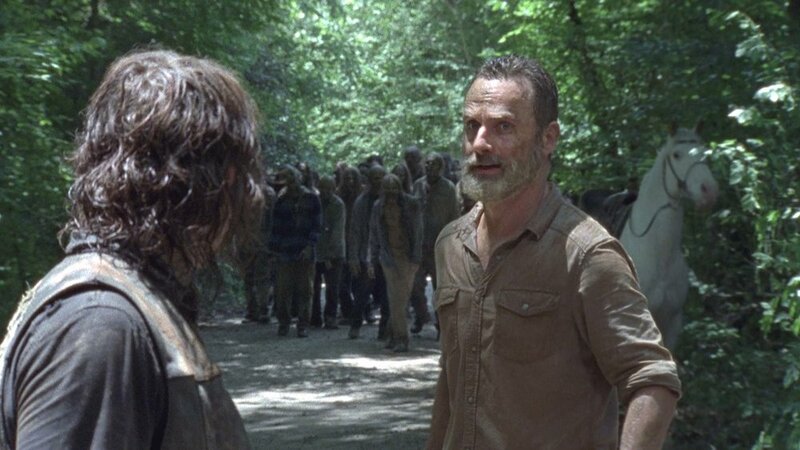 Undoubtedly, Season 9 of The Walking Dead has been one of the most intense seasons to date. And, with 9B just around the corner, I'm here to catch you up on the mayhem and pain that was 9A. A New Beginning has really begun. The group has begun to reshape humanity into some form of civilization that used to exist. Rick is the leading man as he forever and always will be. He leads the group into the city for much needed items. He wants to help the Saviors but no one else does. While some form of humanity is bein9g founded again, Gregory tries to have Maggie killed but winds up being the one who is removed from the world. Rick tries his damndest to get all of the communities in board but some heads just won't stop clashing. While the bridge to their trade road is being fixed, tensions are at an all time high. Even though he doesn't want that, Daryl is in lead of the very people he hates...The Saviors. He attempts to do what he can but his nature is resisting. Rick takes the news to Negan who is happy to hear about the world Rick is preparing for him. Warning Signs was definitely the straw that broke the camel's back where Rick's wanting to help tbe Saviors was concerned. Episode 3 was when Daryl began to get through to Rick again with reason. Saviors had begun to disappear one by one and this was concerning everyone. Anne has troubles dealing with leaving and Gabriel can't leave that fact alone. Maggie and Daryl discover where the Saviors are disappearing to...and it's well owed. Officer Friendly took us through one last helluva ride. At least while he was on the show. While I hate to admit it, episode 5 was one of the best episodes in a long while. He made us understand why he is the ultimate leader and what it means to be Rick Grimes. While we saw ones who we missed and cherished deeply, our biggest fear was upon us; Rick's death. Thank God, but he's still gone. Sadly. Thanks to Jadis, she saved the day. And Officer Friendly lived to see another day and we saw Judith step up to Dad's role. After a six year time gap and a new Grimes running the show, some newcomers came along and made their welcome to our band of survivors. With momma Michonne and Uncle Negan guiding the way, she's got this world mastered. But the newcomers aren't met with wide open arms. Not initially. They decide to send them to Hilltop for the time being. Michonne finds out about a few things and a new threat is established. Upon delivering new people to The Hilltop, Michonne discovers that some of her people have been injured along with being in places where they do not belong. Carol and Michonne meet up and talk but not very pleasantly. They decide to agree to disagree. In the Mid-Season finale, the group got more than they expected and could've ever asked for where a threat is concerned... Before knowing what it was, Daryl, Aaron and Jesus head out in search of Eugene but come across a whispering threat. They attempt to escape, but not before losing Jesus to a Whisperer and becoming surrounded by a pack of the dead and disguised dead and leaving us with a cliff hanger. Season 9A was undoubtedly one helluva ride. I am so ready for 9B. Are you!? Thanks for reading.